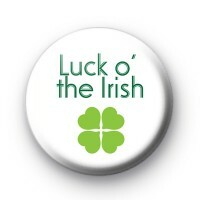 White Luck of the irish St Patricks day badge with a large green shamrock and luck o the irish written in a green font. This badge is perfect for St Patrick's day and is really popular with all o our customers. Luck o' The Irish Shamrock Badges. Perfect if you are visiting Ireland for St Patrick's day or you celebrate this Irish day. Standard 25mm badge hand made in our UK workshop. We have loads of cheap St Patrick's Day badges so be sure to check those out in our St Patrick's Day category.